On your arrival at Calicut (Kozhikode) airport, meet our representative and proceed towards the picturesque Wayanad; the land of Paddy fields, dense forests and breathtaking waterfalls. On reaching Wayanad, check-into the hotel. The rest of the day is free for you to explore the place on your own. Overnight stay in Wayanad. On day 2 of the tour, visit the Kanthapara waterfall, surrounded with bamboo forests. Relish the wonderful view of water cascading from a particular height. Later, we will head to Kuruva which is a small river island. Blessed with divine beauty of green jungles, Kuruva is considered as a paradise for nature lovers. The serene ambience of the island might leave you awestruck. Stay overnight. The 3rd day of the tour takes you to the Edakkal caves. The depth of the cave is almost 30ft. Then head to Meenmutty Falls. 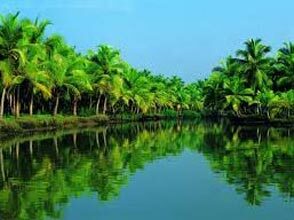 Meenmutty, one of the great places to relax and relish the amazing sunset view in the dark green jungles. Further, experience the wonderful Wayanad from the top of Chembra peak. Chembra is the tallest peak in the Wayanad region and is frequently visited by adventure lovers. Overnight stay.